Nucleotides are most well known as basic components and building blocks for nucleic acids, including DNA and RNA. Other than this, nucleotides also have various roles in biological activities. For instance, cAMP has been proven to be a secondary messenger and regulates downstream signaling pathways, and ATP helps to carry chemical energy to drive metabolism process. One of the derivatives of nuleotides, NAD, also takes part in energy metabolism through regulating electron transfer reaction. MtoZ Biolabs offers targeted nucleotides analysis service using GC/MS (7890A/5975C) and ACQUITY UPLC/TripleQuad5500 (Waters/AB Sciex), which has characteristics of high accuracy, specificity, and sensitivity. 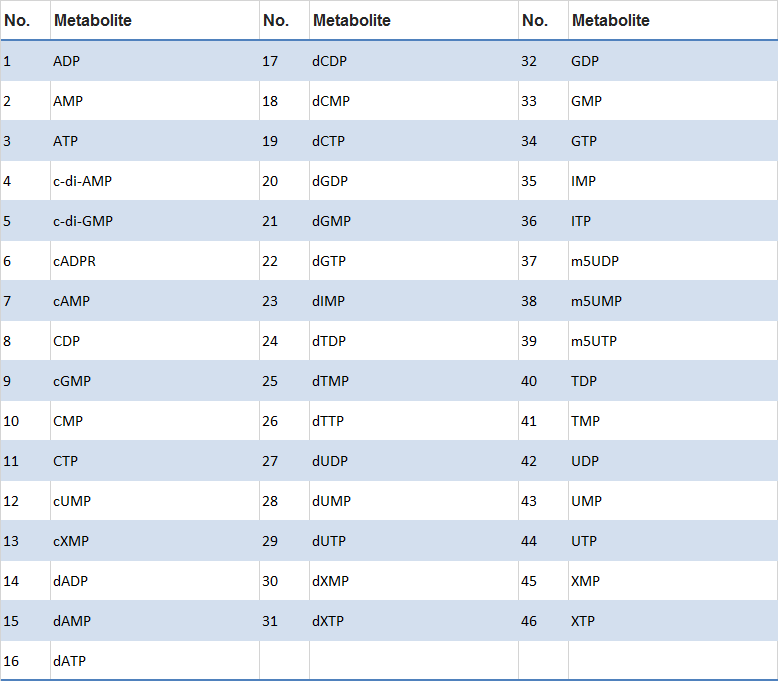 Our service enables fast and accurate analysis of multiple nucleotides and derivatives, including ATP, cAMP and NAD, etc. We guarantee accurate analysis of nucleotides even in low abundance. With our optimized sample preparation methods, interference from high-abundance dominant metabolites can be greatly reduced, thus further increased the detecting sensitivity.